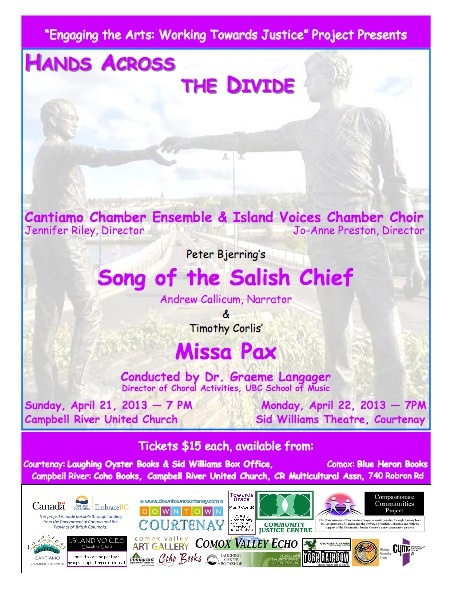 I was very glad to find out from my good friend Hussein Janmohamed that Island Vocies Chamber Choir and Cantiamo Chamber Ensemble performed the Missa Pax this past weekend in Campbell River. Many thanks to Graeme Langager for directing this concert entitled, “Hands Across the Divide.” Sounds like a wonderful event. Proud to be able to contribute to it through the music. I’d like to offer a sincere word of praise for Noel Edison, John Marshman, and the TMC for their brilliant performance of “God So Loved the World.” I feel very lucky to have been able to attend – what a meaningful event!